Additional information Excellent condition inside and out. Good tyres and brakes all round, clutch replaced. FSH. 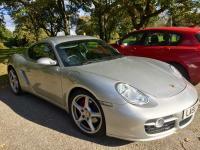 Owned by me for the last 3 ½ years, purchased from Northway Porsche. Boroscope test receipt from 9 Excellence 28/08/2018 shows no bore scoring.Clutch replaced by Northway at 63,000 miles, Rear Main Seal replaced at the same time. Built after 2005 has the stronger IMS bearing. Full service history at main dealer and Northway Porsche. Message me for more photos. Spec: Porsche Active Suspension Management (PASM), Bose surround sound system, climate control, heated seats, leather extended to doors, 19” Carrera classic alloys all in excellent condition. Full Service History: Porsche Main Dealer @ 13671 (12/12/08), 23746 (23/12/10), 39129 (20/12/12). Northway Porsche @ 52470 (23/12/14), 64605 (13/01/17). All 4 tyres replaced at 64,000 miles Michelin Super Sport, all with lots of tread depth remaining and even wear. Rear brake pads replaced at 68,000 miles. MOT due on 27/12/18, happy to have it MOT'd before sale if the buyer can wait until 27th/11, the earliest date DVLA will allow for renewal.